Sir Edmund Hillary achieved both fame and infamy as a legendary explorer. His fame came from being the first man to ever climb to the top of Mount Everest. His infamy derived from his ludicrous search for the Abominable Snowman. 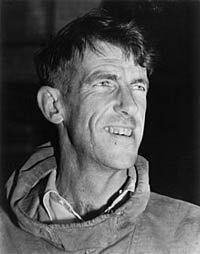 Sir Edmund Hillary was born on July 20th, 1919 in Auckland, NZ. He became interested in mountaineering at a very young age. Hillary was short in stature as a child and this lead him to being teased by his classmates. He somewhat withdrew from his peers and found solitude in his readings where he would dream of taking part in great adventures. By the age of 16, he would have a huge growth spurt and tower over his peers. His interest in adventure would not go away. Hillary visited Mount Ruapehu with his classmates and his love for mountain climbing was born. Even when he attended the University of Auckland, he could not leave his love for climbing mountains behind. He would end up taking part in a number of climbing adventures. In 1939, he would complete his first major climb when he reached the summit of Mount Ollivier. As with many millions of young men, Hillary would serve in the armed forces during World War II. Initially, his religious beliefs kept him out of the war. In 1943, he believed his service was truly needed and he joined the Royal New Zealand Air Force. A major injury would end his service not too long after. On January 30th, 1948, Hillary would be one of the men who reached Aoraki/Mount Cook, New Zealand, the highest peak in the country. This gained him quite a bit of fame and he started to work with the legendary Eric Shipton on a series of expeditions to the Himalaya Mountains in Tibet. In 1951, Hillary took part in a reconnaissance mission funded by the British. This would be his first climbing experience on Mount Everest. In 1953, he returned to the region and made history. This was the most difficult of all mountains in the world to climb, but Hillary’s innovative abilities and skills at navigating the trek contributed to his success. Reaching the top of the mountain made him famous all throughout the world. After climbing Mount Everest, Hillary felt he discovered compelling evidence for the mysterious creature known as the Abominable Snowman. He, sadly, lent his credibility to the notion the creature existed. Hillary garnered some fame for this, but he also met with a lot of ridicule. In time, he gave up his search for the mysterious monster. Sir Edmund Hillary eventually continued on other expeditions and even traveled to the South Pole. He passed away in 2008. To this day, he remains the most famous of all mountaineering explorers.